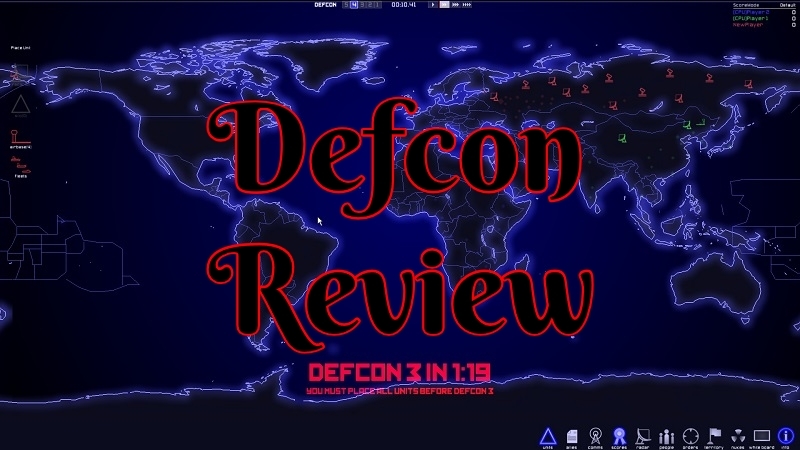 Defcon is a simplistic real-time strategy game that counts the world down until nuclear options can be used and total devastation is ensured. If your first thought when looking at the game is “shall we play a game” in a robotic voice playing in your mind this game was in fact inspired by Wargames the movie. This is also why they went for a more retro looking graphics even for its time. Still, it is one of those older games. I ended getting it buddle with another game years ago and just forgotten about it. I did not at the time realize the beauty in simplicity. I might have played it once and moved onto something flashier, deeper, and overly long. 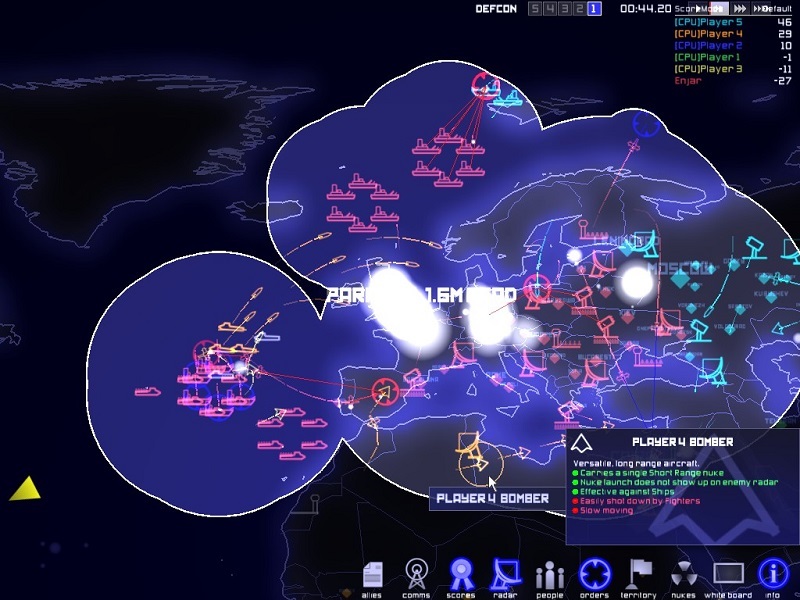 Quite a number of real-time strategy (RTS) games come in mind. It does not have a bunch of fancy tech trees that you will spend the entire game fussing over plotting the perfect route. You will not be finding yourself spending hours gathering resources just for them to go unused. Heck, each game does not last very long and I did not even notice a way to save the game. 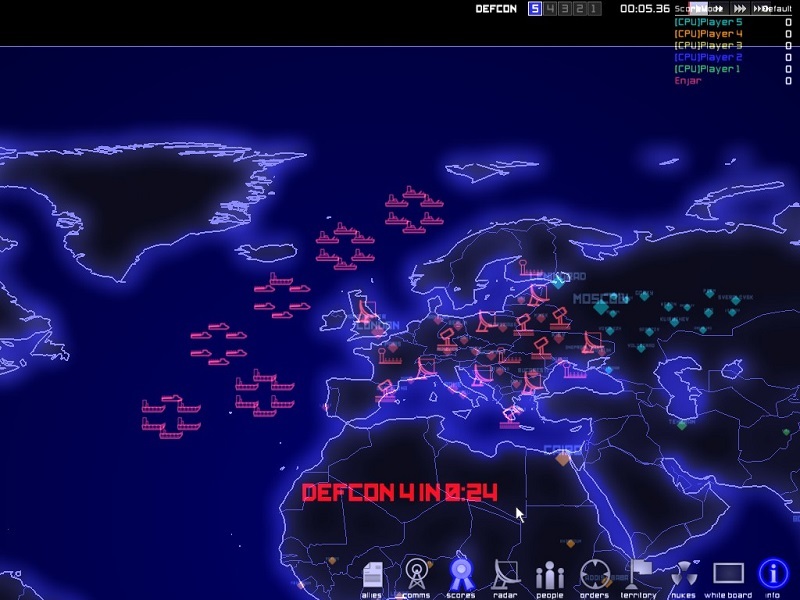 The world counts down from Defcon level 5 where there is no fighting between nations. You start placing down your defensive or offensive buildings and units. In an attempt to protect your cities since the score is based on population by default. The counter strikes zero and the Defcon moves down another step. Then fighting between you and other nations start to break out and things become more intense the lower Defcon level goes towards 1. It felt like playing a game of chicken where the first one to launch everything they had leaves themselves undefended in their ability to strike back. Meanwhile, the other AIs and I could see this as a window to take advantage of things. Depending on your placement of things like radars you could see a little bit into other countries and everything within its range that was heading your way. From airbases to carriers unloading bombers some equipped with a nuclear option waiting to unleash devastation. You could even get some scouting done with your flying units if you felt it was worth the loss to uncover missile silos or radar dishes. After all, if can destroy their buildings that leave them quite open for end game. 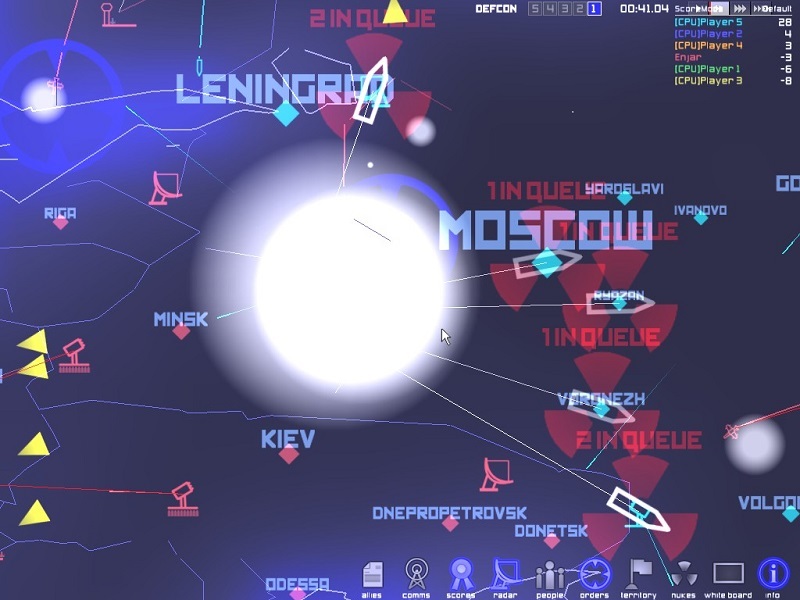 Then the Defcon level ticks down again this time removing the ability to place any further buildings or ships on the map. I like the fact the game gives you some time to place the limited amount you get at the start. It also does not overcomplicate things with you trying to build more. So really you as the player don’t want to hold off too long in getting everything placed down. As you the player could have been trying to do things like scouting or preemptive measures. Then it happens. 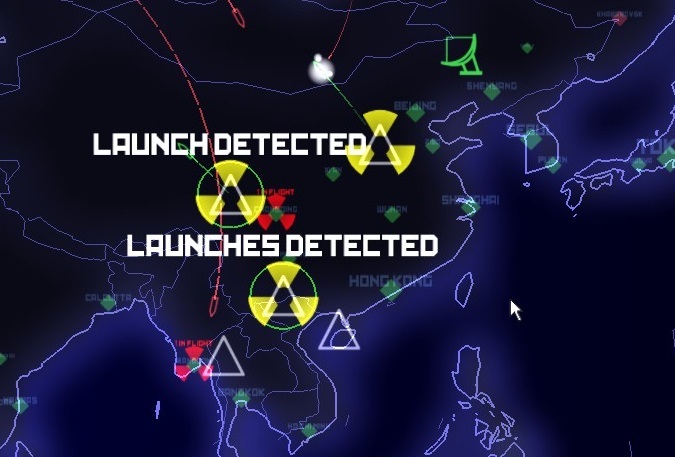 Defcon 1 strikes and the map lights up with launches detected as the AIs starts to unload their nuclear payloads. You start to see the misses fly across the map and try you to target them down with your airbase units or hope what remains of your silos automatically takes them out. You can become overwhelmed by massive attack waves towards the end but for the most part that was not the case. This is not an RTS that requires 300 actions per minute to be able to enjoy it. If all you’re doing is playing against the AI you have great control over how fast or slow the game time is moving from real-time to quite a lot faster. While the game timer itself might have said 3 hours an entire game for me lasted 30 minutes to an hour on some of my games. Which means you can hop in, play a full game and go about your real life without this consuming every moment of your life for weeks. Up to some point, you might have been playing a careful game holding most of your arsenal in reserve waiting to get the last hits in and pull away with the highest score. The game has one final countdown timer when it strikes zero the game has ended. This happens after the world hits Defcon 1 and so much of the worlds nuclear arsenal has been used. Which was nice to see as it ensures there is no long term stalemate of the giant game of chicken you been playing the entire time. If you wait too long your misses won’t land in time and they were a waste. I like that kind of gameplay as I just hate waiting around hours for a player to make a move or for an opportunity to open up for someone to strike. Just get it over with already before everyone playing dies of old age! There are a number of different game modes to play when default is getting a bit boring. I found the cheekiest one called “office mode.” Where they make it easy to quickly window out of the game, have game sound off, and even will close out of the game if it left running for far too long. You don’t usually see a game encourage people to play at work but I like what they did there. There was also another that force everyone into one giant alliance and you can only lose points from there as it starts to fall apart. That is for certain an interesting twist on how the world could become united and shares way too much information about each other being someone decides to take advantage of such information. There were other options as well but these are just the ones that caught my eye. While the game does have this feature it is an older game so there were not that many games to see open. It is at least a quick game so of the small number of people playing I could see people finding games. This was not something I ended up testing out. I just went with playing vs Ai’s. I did, however, notice seeing the message a couple of times while playing “player failed to join the game.” My games were already in progress and I suspect people were just trying to find a game to play. There are some in-game tools like a chalkboard that I never used. Along with alliance chat and even ceasefire options in one of the menus. There was an option to invite friends as well. This would seem like the most logistical thing to do if you really wanted to play multiplayer. As the AI itself seems a bit predictable and no reason to use some of the in-game features otherwise from the best I could tell. This has to be on the price point of $9.99 on a game nearing the 14 years old mark. It does not have a lot in the game so comparable to newer indie games coming out around this price point. It does not make much sense to pay full price. This game does get bundled with other games quite often as with the case in how I got it. The only reason I can see keeping it listed at $9.99 is so it can be deeply discounted when platforms are having site-wide sale events. People see it and think “that must be a great deal.” It’s had time in the sun just put it down to $1.99- $4.99 without a sale and let people buy it whenever instead of waiting around for a sale to feel the price is justified. If you pick up this game for cheap it’s one of those I would call a weekend throwaway game. You play it a couple of times over a weekend and you forget about it. Till such time you play a couple more times and repeats the process. 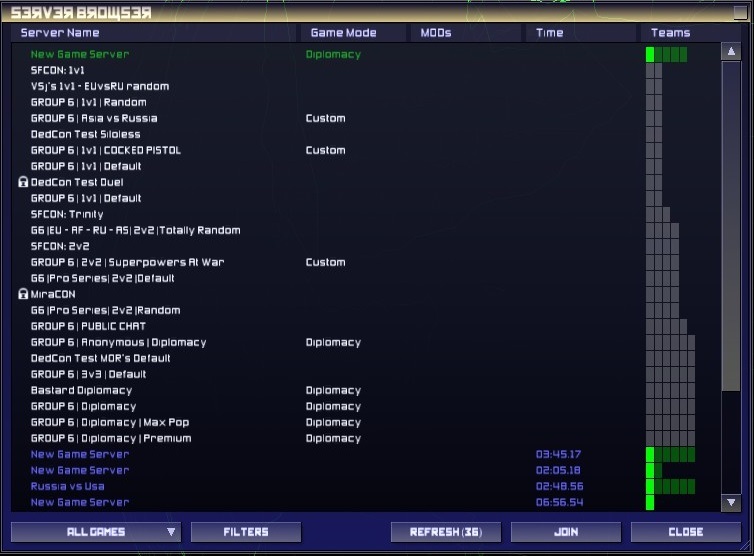 It does at least have a nostalgic feel and a node towards the Wargames film. Unless you plan on finding a bunch of mods to change up your gameplay (there is no workshop on Steam but there is a mod website. What makes it great is also what takes from it in the end. It does lack that depth to have a lot of replayability in my eyes over the long term. Once you nuked the world a few times by launching from your silos and carriers you get to do it again and again. Otherwise, this is a great game to have some quick fun and not be fully invested into it for weeks on end to be able to enjoy it.